Dogs and cats have evolved to eat meat and bone. The structure of their jaws, their teeth and their digestive system have not changed at all since the days that they would hunt and scavenge for their food, which is why it makes sense to continue to feed them raw meat and bone, just as nature intended. 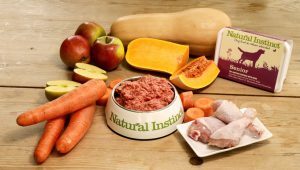 Natural Instinct is a Biologically Appropriate Raw Food (“BARF”) for dogs and cats providing a balanced nutritional and delicious diet. Their products are all made in Surrey using human grade ingredients. They work hard to provide as safe a product as possible, which is a process that starts on the farm with the selection of healthy animals and involves the all important deep freezing process. Recipes are made using 100% British meats and the freshest fruit and vegetables (for dogs only) and are free from artificial additives, colours, preservatives, fillers or grains. What are the benefits of feeding your dog Raw Ingredients? example is designed for nipping, tearing and crushing/macerating meat and bone and has no side to side grinding ability that is needed for plant fibres. The gut is short and the stomach small with strong acid which is adapted to high meat and bone based diets and not for the breakdown and fermentation of high starch and plant fibre based diets. Even though the domesticated dog largely uses humans to supply their food, they have never learnt to cook and never get excited about a field of corn… other than when a rabbit is running through it! What are the health benefits of feeding raw dog food to an older dog? The health benefits of feeding high quality balanced raw dog food are the same for an older dog as they are for a young or middle-aged dog. Well-formulated raw dog food is the biologically appropriate food for dogs with no processing, no artificial preservatives or colourants and no hidden ingredients. With increased heath issues relating to the human diet such as obesity, high blood pressure and diabetes people are now taking more care about their own diets and are eating “cleaner”. Pets are such an important part of the family and owners are following the principles for their own diets for their pets – feeding as nature intended, free from artificial additives, colours, preservatives and fillers. We receive numerous testimonials from customers saying how uncomfortable skin, coat, teeth and joint conditions have been resolved following a transition to Natural Instinct. Problems relating to digestion, breath and aggressive behaviour have also shown improvement. Increased health and vitality, as well as an alleviation of IBS and colitis have also been named. Why is it important to change a dog’s diet as they get older? As dogs’ age they may be subject to more wear and tear issues such as arthritis and the geriatric animal is more likely to have less efficient organs such as the kidney, liver and immune system, so the food needs to be adapted to these potential changes. Many of these things lead to a reduction in the level of exercise and activity, which also changes the dogs’ calorie requirement. 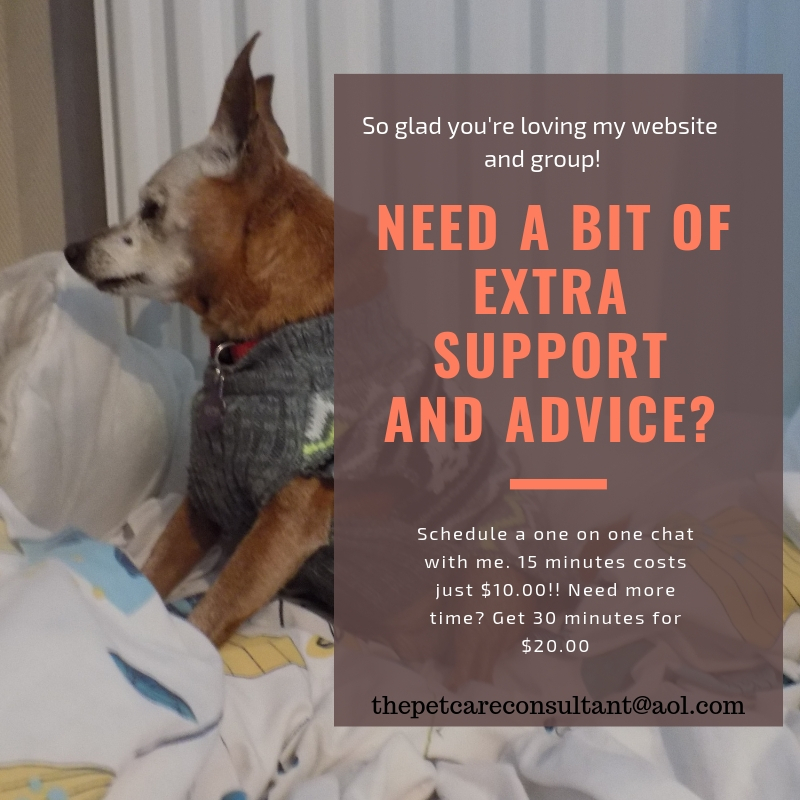 It is very individual just as it is in humans and this is where routine health checks in old age to check organ function can be a great help in assessing the dietary needs of your dog. 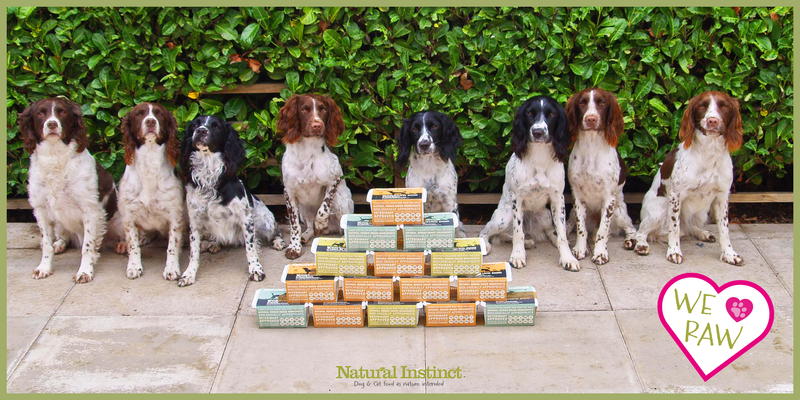 Natural Instinct’s Senior recipe is made using human grade chicken and bone, together with the freshest apples, carrots and butternut squash, spinach, sea kelp and Scottish salmon oil, the Senior recipe is suitable for dogs who feel their age or have joint and mobility issues as it contains additional supplements. The addition of Vitamin C helps support the immune system and the added Glucosamine and Chondroitin help aid aging and stiff joints. Chondroitin is a natural substance found in a dog’s cartilage and, when paired with glucosamine, has an even more beneficial effect on a dog’s joints. How should older dog owners transition their dog to a raw diet? Firstly owners of older dogs need to fully assess the health status of their dog and know any individual requirements e.g. an older dog prone to pancreatitis will need lower fat formulations, arthritic dogs will need higher glucosamine content and will need particular attention paid to not becoming overweight due to their reduced activity levels so may need less than the average feeding rate. Our advice for those who do wish to convert is to slowly transition over a 2-week period and support the dog with probiotic during this period (Natural Instinct offer a Zoolac Probiotic Paste). The body needs time to adjust to a completely different diet and this may take longer in older animals – slow is best to allow adjustment to take place and prevent constipation or diarrhoea during the switch over period. In geriatric animals or very sick animals it may not be appropriate to convert them from a processed to a raw diet if they are currently stabilised on the diet that they are on. I have no association with Natural Instinct, financial or otherwise. I approached them to write this article, as it is a diet I am interested in including more information about on this website.